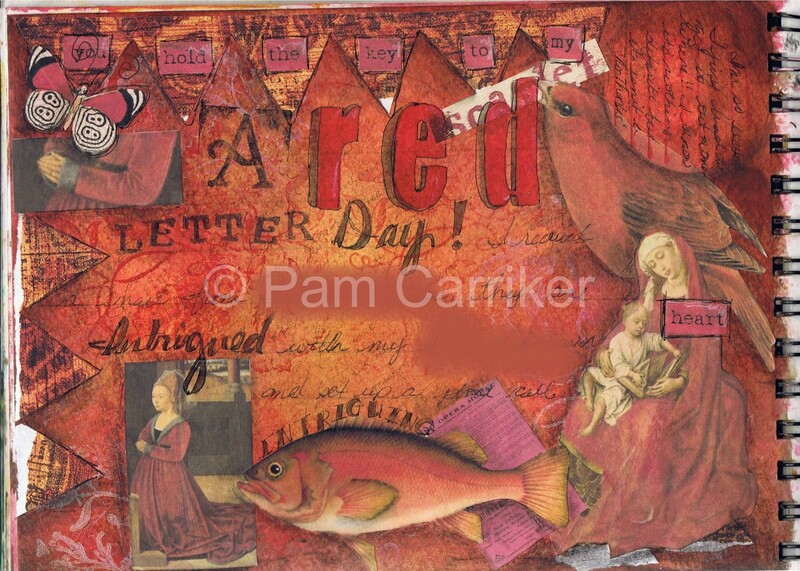 What a perfect color for a RED letter day! I had to blur out the writing a bit as this page has journaling about things I’m not ready to share, but I just love it when things go together. I already had my page partially done when my red letter moment happened and I knew exactly what I would journal about. Keeping a journal is such a fun way to have something to look back on later. Pam I agree with Lori, it really doesn’t matter what medium you work in you are definately the TEACHER!!! I’ve learned so much by seeing all your work…it’s just awesome!!! HELLO TO YOU FROM ME I NORWAY… I CAME OVER YOR BLOG… AND I JUST LOVE YOUR WORKS. I’M ALSO MIXEDMEDIA ARTIST, BUT I NEWER SEE ART AT THE WAY YOU CAN DO!i’M YUR FAN:)HEI FROM NORWAY AND INGER BENTE! pam, first of all, this page ROCKS!!! second, i’m so excited about your news. can’t wait to hear about it. take care.